Pottery Suitable for a Future King – Pottery Sherds at Hemyock Castle"
14th or 15th Century: High-Status Pottery Suitable for a Future King? In 1459, during England&apos;s Wars of the Roses, Sir John Dynham spent his fortune obtaining a ship and smuggling the future King Edward IV to safety in Calais, France. But all the usual ports on England&apos;s south coast were being guarded by Edward&apos;s enemies. Quite possibly, the high-status 15th century pottery found at Hemyock Castle was used to serve the future King Edward IV when he was smuggled through Devon to Hartland, to board the ship at a north Devon port. The English civil wars later known as the Wars of the Roses (1455 – 1487) started soon after the end of the Hundred Years War with France. These Wars of the Roses between supporters of two rival Houses of Plantagenet, Lancaster and York, were about succession. King Henry VI was weak; Richard, Duke of York had been his heir, until the birth in 1453 of King Henry&apos;s son Edward. Richard&apos;s claim to the throne of England, triggered the Wars of the Roses; so called because Lancastrians were (later) said to favour the Red Rose, and the Yorkists to favour the White Rose. 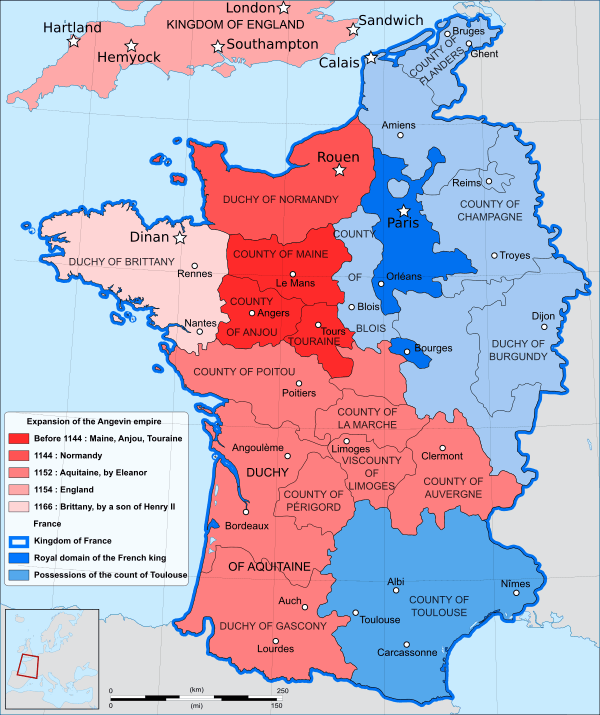 The power of the French Kingdom was ever present in the background, and not always friendly to England. Initially, the Yorkists gained the advantage. But with the help of treachery, threats and promises at the 1459 Battle of Ludlow Bridge, powerful factions assembled by King Henry&apos;s Queen, Margaret of Anjou, captured the Yorkist stronghold of Ludlow Castle, putting the Yorkists to flight. Edward, Earl of March, with Warwick and the Nevilles, sailed from South Wales... intending to join Edward&apos;s father the Duke of York in Ireland. But they were blown across to England&apos;s West Country. Here, they were rescued by Sir John Dynham of Nutwell and Hartland. Sir John used most of his family&apos;s wealth, obtaining a ship and smuggling Edward&apos;s party to the fortified port town of Calais. (Then in English hands.) They had to use a north Devon port, because all the usual ports on England&apos;s south coast were heavily guarded by Edward&apos;s enemies. Amongst Sir John Dynham&apos;s many other successes, were his two raids against King Henry&apos;s forces at Sandwich, Kent. During the first raid he captured Richard Woodville, 1st Earl Rivers, a supporter of King Henry who later became son-in-law to King Edward IV. After Edward Earl of March became King Edward IV in 1461, he – perhaps somewhat grudgingly – rewarded his loyal life-long supporter Sir John Dynham, including by making him the 1st Baron Dynham... but without the usual grants of lands. King Edward IV, born at Rouen Normandy in 1442, had many more dealings with France, including when France&apos;s King Louis XI supported Warwick&apos;s invasion of England in September 1470. King Edward IV fled to Flanders, under the protection of his brother-in-law, Charles, Duke of Burgundy. After King Louis XI declared war on Burgundy, Charles helped King Edward IV to raise an army and eventually to regain his throne in April 1471. King Edward IV declared war against France in 1475, but his ally Charles, Duke of Burgundy failed to help. Under the 1475 Peace Treaty of Picquigny, King Edward IV accepted an immediate payment from France of 75,000 crowns and an annual pension of 50,000 crowns. So, was this high-status pottery used to serve the future King Edward IV? Sir John Dynham&apos;s family owned Hemyock Castle. So it is very possible that that the future King Edward IV was smuggled via Hemyock Castle. Dinhams, Notable Owners of Hemyock Castle.